A new series starts on Tuesday, 13th September, at 19:30 on ITV1 and ITV1 HD. Mayday! Mayday! 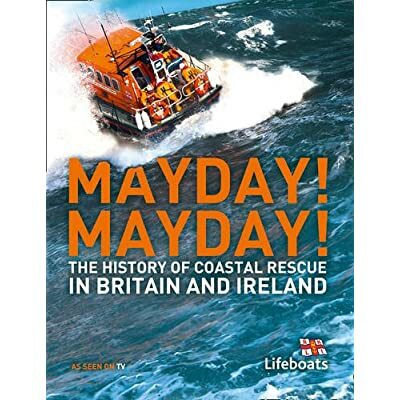 brings you footage from actual rescues around the UK and Ireland by the brave crews of the Royal National Lifeboat Institution (RNLI). This has to be a big DON’T MISS IT for all lifeboat enthusiasts – but don’t forget, you can always watch it on ITV Player for up to thrity days after airing if you do. For further details please visit the ITV1 web site. There is a book to accompany the series – why not buy it through our on-line book service and save yourself money. RRP is £20.00, you can buy it through our shop for just £11.80, saving more than £8 (41%). Convinced? Join the Lifeboat Amateur Radio Society and help us to support the RNLI through Amateur Radio special events and raise money through our fund-raising events, such as SOS Radio Week. The Lifeboat Amateur Radio Society attended the Marches Radio Society in Chirk last night to introduce the group to the activities of the Society and our annual fund-raising event, SOS Radio Week. The evening was well attended by Marches RS members during which time they watched a video presentation and listened to both Derek (Chairman) and Simon (Vice Chairman) explain about the Royal National Lifeboat Institution, the Lifeboat Amateur Radio Society’s foundation and mission and how they can take part in SOS Radio Week as a club. David, the founder of SOS Radio Week, was also in attendance and answered some questions from the floor. We’d like to thank Marches Radio Society for their hospitality, the new members for joining on the evening and the very generous donations made by the members, all of which will go direct to the Royal National Lifeboat Institution.